Cuadrilla's Grange Hill site Singleton 2015 showing the now un-used well head in centre right of the cleared land. County planning chiefs have rubber-stamped their decision to refuse plans to use a dormant shale gas bore hole for monitoring. The site at Grange Hill, Singleton, was drilled in 2010 but never fracked and energy company Cuadrilla had applied for planning permission to use it as a seismic and pressure monitor station before it is restored to original condition. “I believe members have a duty in all fracking applications conditions to ensure proper monitoring is addressed prior to planning permission being granted. But County Hall turned down the bid in February and commissioned a report which this week outlined why. It said under planning guidances CS5 and DM2 it should be refused on the grounds that it would affect the visual amenity. During the meeting, Coun Stephen Holgate expressed concerns that pressure monitoring would in effect be fracking and said he also had serious worries about the observations of gas wells once they had finished fracking. 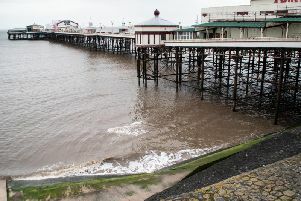 His concerns were echoed by Coun Peter Buckley, who said he did not think that the Environment Agency would keep a close eye on abandoned wells for long enough. The county council’s planning chief Stuart Perigo pointed out that no fracking had or would take place at the Singleton bore hole and Jill Anderson from the legal team pointed out that such an addition may leave the council open to challenge. Anti-fracking campaigners Friends of the Earth said they were delighted to hear that Lancashire County Council has formally rejected Cuadrilla’s application for shale gas appraisal at Singleton. But a Cuadrilla spokesman said: “Friends of the Earth’s claim that our planning application for Grange Hill was for ‘shale gas appraisal’ which ‘would have involved creating small fractures in the rock and testing the flow of gas’ is ridiculous and entirely misleading. “The fact is this application proposed to use the existing well, drilled in 2010, to carry out seismic and pressure monitoring after which the well was to have been plugged with cement and the site restored to greenfield status. “The application did not entail any drilling or hydraulic fracturing operation. “The well at Grange Hill has never involved fracking.